Is a full length contemporary romance novel by ‘J.B. Salsbury’ In this we meet Emilio aka Milo and Mercy. 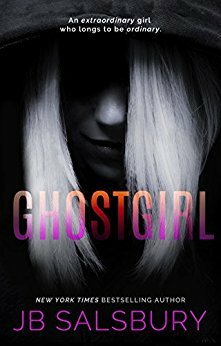 I wonder if many like me went into this thinking it was a paranormal read? No one?? All righty then!! So it was a bit of a surprise realising that it in fact wasn’t a paranormal read. The cover, luv it, it's unique and stands out!! the reviews, hooked me in further. I've only read one other by this author before which I really enjoyed and this book was just as good if not better!! Mercy is a bit of an enigma, we don’t really know much about her, her names not her own it was given to her by caseworkers, and as far as we know she has no family, even her age is unknown, she was found barely alive in the desert, a girl who fell out of thin air. But as you progress further into the book small facts pop up about Mercy, things that made for a gripping, suspenseful read. She's been placed in the same safe foster home as Milo. When these two meet Milo is shocked by how white she is, not only is her hair bright white but her skin is whiter than he's ever seen before. If she were in the sun, she'd practically glow like some kind of mystical fairy.She barely leaves her room. It's not until she's enrolled Washington High, the same school as Milo that you see these two becoming closer, she's drawn to him, at first it was because of his Virgin Mary tattoo on his throat but then it became so much more. She's more mature than any of the girls at their school and they have such a unique connection, he tries to help her fit in, to have a normal teenage life. He wonders how he ever lived life without her. I didn't notice before, but she really is pretty-different, but still gorgeous once you get past her ghostly colouring. Milo was born into a notorious gang 'The Latino Saints', and at the age of fifteen he became a LS soldier, gang affiliations cover most of his body, no greater loyalty existed in his world than that of the Saints, but that all changed, and now at the age of twenty he's trying to disassociate himself from that life and is striving to make a better life for him and his brothers, when he's of age he wants to get legal custody of them, get a good paying job and an apartment. I'm twenty years old, with the responsibilities of a forty year old man with two kids. But that all changes in the blink of an eye. This is where we're all wanting to jump onto the next book to see how things unfold because Milo sold his life to the devil to save an angel and now he's out seeking revenge. If your'e after something a little bit different then look no further than this book.